Gearing up for Ash Wednesday? 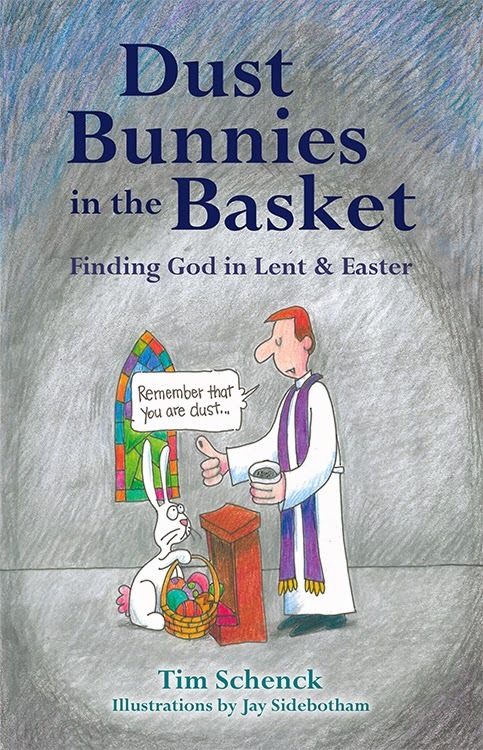 Here's the title chapter from my new book Dust Bunnies in the Basket: Finding God in Lent and Easter. Illustrated by the incomparable priest-cartoonist, Jay Sidebotham, it serves as the companion guide to Dog in the Manger: Finding God in Christmas Chaos (also illustrated by Jay). If you're looking for a fun guide for your Lenten journey (I mean, besides Lent Madness), I hope you'll pick up a copy. It also has discussion questions at the end of each session if you have a book group or just seek further individual reflection. Somehow both of these books slipped through the cracks at Forward Movement, where my archnemesis, Scott Gunn, is the executive director. He was probably lulled into submission by the awesomeness of the accompanying illustrations. He has also informed me that for a LIMITED TIME ONLY, the book (already dirt cheap at $10) is available at 30% off through Forward Movement. Use code LENT15E2 at checkout to receive the discount. I don’t like dust and I especially don’t like dust bunnies. You know those mysterious furry things that lurk behind your bedroom door, or in your closet, or under your bed. Who knows how they got there? Who wants to know how they got there? But they’re there, and I don’t like them, especially when they move around. You’ve probably seen them do this: you open a door, look behind it, and the dust bunny catches just enough air that it seems to start hopping away. Cleanliness may or may not be next to godliness but dust bunnies show up whether or not we’re compulsive dusters. Even Mr. Clean himself occasionally sees dust bunnies in his pantry closet—and his clean- shaven, earring-wearing self is horrified. Fortunately, this doesn’t turn us into walking, talking dust bunnies. God’s not going to sweep us away with a giant feather duster. But the words of the Ash Wednesday service remind us that there is something greater out there, greater than what we can see with the naked eye, greater than our hopes, fears, and dreams. And that something is God. It’s not that we’re as insignificant, useless, and annoying as dust bunnies; it’s just that the world doesn’t revolve around dust, and it doesn’t revolve around us. God is the center of all life and creation, which doesn’t mean we’re useless; we’re just not in control. Think about dust for a moment. There are two ways to create it, through inactivity and activity. If you go downstairs into the part of the basement that rarely gets used, the part where you store old boxes full of books or that pair of cross-country skis you’ve long since outgrown, you encounter dust. Run your finger along those skis and you get a tangible reminder that they haven’t been used in ages. Your finger is suddenly covered with dust, and you might even sneeze once or twice. Then there’s the other way dust is created, through activity. That’s how those dust bunnies in your bedroom came to be. Through the everyday activity of life, you create dust. It comes in on your shoes or your clothes, or on the kids’ backpacks. If we’re not kicking up some dust, we’re not really living. Jesus encourages us to kick up some dust every now and then, to roll up our sleeves and get involved with the world and the people around us. We might get dirty every once in a while, but that’s okay. Through our relationship with Jesus we are cleansed, renewed, and dusted off time and time again. All of this is why I like to hold a children’s Ash Wednesday service every year. Not many churches do this because there’s a natural inclination to shield our kids from concepts like mortality and human sin. And the idea of dumping ashes on the heads of young children and telling them they’ll eventually die gives some clergy the willies. But ignoring an important and integral part of life isn’t the answer. You certainly don’t have to spook children to make the point—though I do know a woman who went to Catholic school and for years was convinced that the ashes themselves came from the bones of dead nuns. I simply like to make age-appropriate connections for children that hopefully lead to further questions. On Shrove Tuesday (aka Mardi Gras), we burn the palms from the previous Palm Sunday. At the next day’s Ash Wednesday service, I invite the children to sit with me as I use a mortar and pestle to create the ashes. As I grind the burnt palms and strain out the larger pieces, I talk about life, death, and resurrection. Then I administer the ashes on their foreheads. Rather than removing the mystery, I find this process draws them deeper into the story and makes the entrance into the season of Lent that much more tangible. Of course, one year I had just imposed ashes at the children’s service with the words “Remember that you are dust and to dust you shall return,” when a little girl looked up and asked, “Pixie dust?” Sure. Why not?